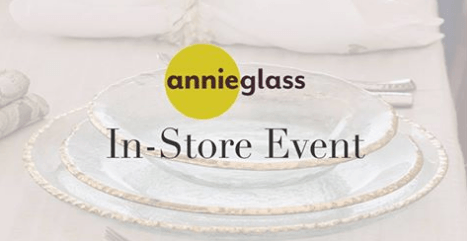 We will be hosting an in-store event featuring Annieglass artist, Annie Morhauser on Saturday, March 30th from 12:00 to 4:00 pm. We will have Complimentary Engraving on Annieglass purchases made from Feb. 28th - Mar. 30th. Also, you will get the chance to enter to win our raffle! If you purchase Annieglass now through Mar. 30th, you will be entered to win an Annieglass serving piece ($200 value). Be sure to attend this great event!